Scientists are boring deep into Japan's Mount Unzen to discover the volcano's hot secrets  secrets that once uncovered will help to reveal why volcanoes behave the way they do. 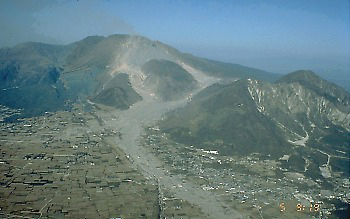 Mount Unzen, in Nagasaki Prefecture, is an active dome complex that last erupted during the period 1990 to 1995. The volcano's eruptive composition is layers of thick lava flows and ash, along with domes of dacite, a relatively high-silica melt matrix. This month, scientists will begin drilling into a still-hot conduit (lava-carrying pipe) of the latest dome on Fugendake, the most active section of the volcano. 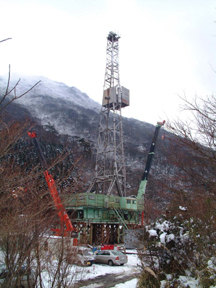 Mount Unzen looms behind the rig that is being used to drill into its main conduit. Photo taken Feb. 1, 2003, courtesy of Setsuya Nakada. Some volcanoes explosively blow their tops, spewing ash and melted rock high into the air. Other volcanoes produce fiery rivers of lava that slowly flow out of active vents. In its recent eruption, Mount Unzen slowly and repeatedly built up magma domes, which collapsed, sending hot avalanches known as pyroclastic flows down the mountain. Lava seeped out at a rate of two square meters per second per day, causing $2 billion in damages over a four-year period and claiming 44 lives. By drilling on Mount Unzen, the scientists hope to learn how the composition of the volcanic lava can be used to predict how a volcano will erupt. "We would like to resolve the mechanism of why eruption patterns differ depending on the volcano," says Setsuya Nakada, a volcanologist at the University of Tokyo's Earthquake Research Institute who is one of the project pilots. "What we want to know is the mechanism of degassing from magma. The textural information is important, because it tells us the way that bubbles grow and collapse in the conduit. The structure of the conduit wall and country rocks is also important, because it tells us the way that volatiles escaped from magma inside the conduit." The best way to understand how magma behaves inside a volcano is in situ inspection of solidified magma in the conduit. High-temperature drilling is an important tool for Hawaiian and Japanese volcanologists, but at Nakada's drill site on Mount Unzen, while the solidified magma has cooled somewhat since the eruption, the material could reach 600 degrees Celsius, making this the hottest drilling project ever attempted. Nakada will work with John Eichelberger, a volcanologist at the University of Alaska at Fairbanks to directly explore the conduit. Since no current equipment can drill through temperatures that high, the scientists will inject large amounts of water into the borehole while drilling. The water, weighted with mud, will alleviate any danger of gas or magma spurting up out of the hole while still cooling the material quickly without altering its chemical composition. The plan is to slant in from the side of the volcano, drill about 1,700 meters, reaching the conduit at a depth of more than 1,000 meters below the surface. Nakada and Eichelberger hope to extract a core sample 200 meters long, providing a cross section of the conduit. Unzen lava dome and Mizunashi River Valley. Gray pathways spreading from the lava dome atop Unzen Volcano are the deposits of many small pyroclastic flows that originated from the dome collapes. During the last eruption period 1990-1995, a few pyroclastic flows swept as far as 5 kilometers down the populated Mizunashi River Valley. Courtesy of the USGS Volcano Hazards Program. "The key observations will be temperature and the actual rock samples," Eichelberger says. And the most important problem, he adds, is figuring out how the gas gets out of the magma in order for this molten rock not to blow itself to bits when it approaches the surface. "We know that this kind of magma contains more than 1,000 atmospheres of gas pressure when it's below ground and if that magma were to come right up, you'd have an ash eruption. But instead you have a lava eruption and we only have a gas pressure of a few atmospheres when the magma comes out as lava, so the gas must somehow escape. We think it escapes into the volcano itself  leaks out of this conduit  at about the depth we'll be looking at the pipe. So we're interested in seeing things like what's the permeability of the magma and rock down there? How fast can gas escape from this thing? What are the structures? Can we actually see pathways that the gas was escaping from the pipe?" The project however has its critics. "I am skeptical that drilling alone would provide any data crucial to assessing the possibility of future volcanic eruptions, their properties and their associated hazards," says Don Swanson with the U.S. Geological Survey in Hawaii. "This is a very large topic. Generally people try to assess these questions by studying previously erupted material and by studying any ongoing unrest at the volcano." So far, boreholes and other studies have yielded new information, but not enough to be able to predict how a volcano will behave once it starts rumbling or to predict the severity of the eruption. Scientists are likely a long way from that. The Unzen Scientific Drilling Project will span for the next three years. Swanson and Eichelberger agree on one thing: leaving seismic instruments, temperature gauges and monitoring equipment in these deep holes to act as observers could be very useful for these predictions. University of Tokyo's link to the Volcano Research Center, which carries a link to the Unzen Scientific Drilling Project.